You’re about 8 years old, you love Ghostbusters and the only real way to play it is to wait for family and friends to stop using the parent’s Commodore 64, for them to quit playing Missile Command on the family’s Atari 2600 or stop trying to save that princess on…you get the idea. With time moving too slowly until 1987 where Kenner will have made an actual proton pack (with ghost trap to follow by 1989) how are you suppose to play Ghostbusters when you’re not on the school playground? Realizing kids had a void in their Ghostbusters playing, Intergalactic Games (corporate HQ located in the future on Mars) from Joilet, IL who arguably made the world’s numero uno card game Uno (see what I did their) came up with a solution that could continue to make them money until we were about 12. Or would it? Intergalactic Gaming creatively came up with Booloon Busters, (simply clever) a card/balloon game that encourages children to pump up balloons until they burst with no adult supervision. OK I made up the latter part. If you could find another kid who liked Ghostbusters before 1986 and wanted to play a REAL game instead of blowing bubbles with a puny “magic” wand you had quite the Saturday ahead. 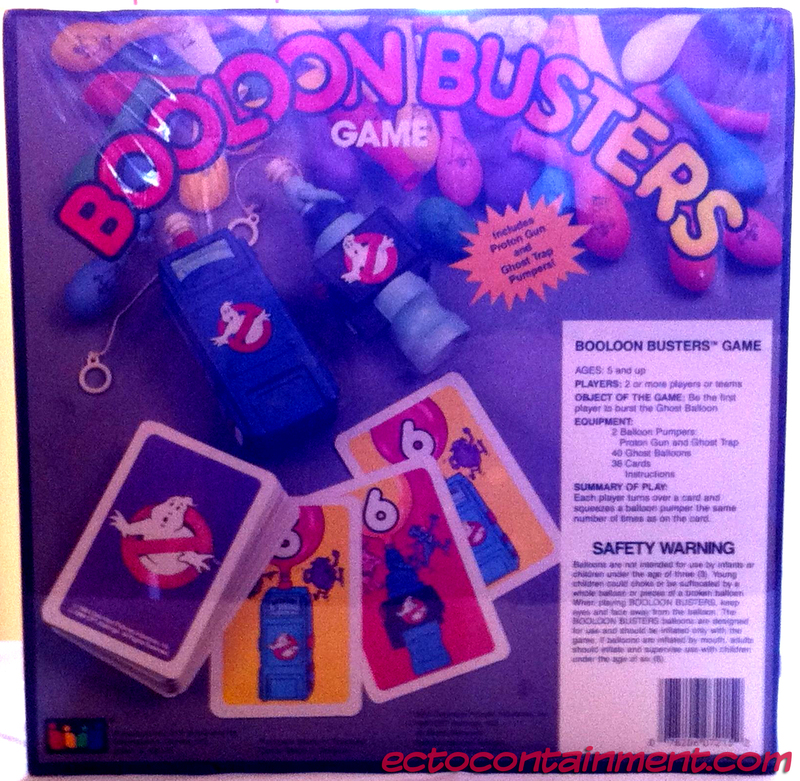 Truthfully I never knew that many young ghostheads and I had never even heard of Booloon Busters until I was 33 years old. This is why I will time travel with Booloon Busters so my young self can become a master of kids card games and he’ll have adult supervision to pop balloons safely. A win win. 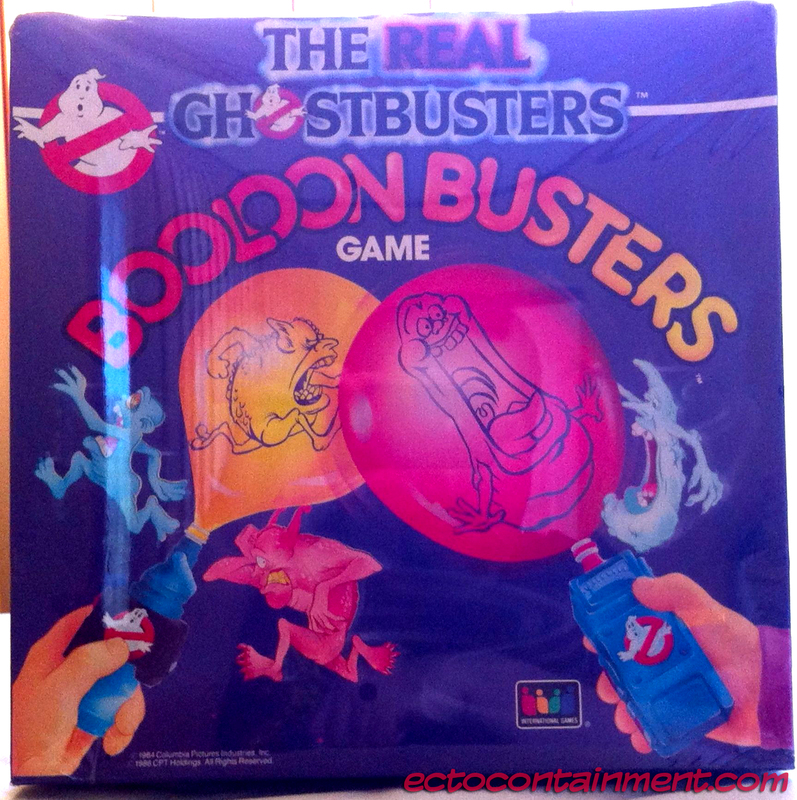 Booloon Busters includes 2 balloon pumpers shaped like a proton gun and ghost trap. Respectively I feel IG’s ghost trap pumper is a cross between an EMF Meter and The Real Ghostbusters ghost trap. We can agree to disagree. Booloon Busters includes 36 cards and 40 balloons. While you could play with more then one person, Intergalactic envisioned kid team outings where our moms would allow us to eat cheese doodles, probably drink a can of cola (hey, no sponsorships here) and chew gum with sugar in it. Those were the days. While the balloon graphics on the front feature Slimer (of course) and what could be Slug from Ghosts ‘R Us, the truth is The Stay-Puft Marshmallow Corporation with its mighty influence left Intergalactic Games no choice, but to print 40 balloons featuring the giant marshmallow himself, The Stay-Puft Marshmallow Man. If I knew it would make a difference I’d send a letter to the past. Intergalactic Games who must have printed a million and 11 Uno cards shut down Uno production for 4 days to print over existing cards to make the OFFICIAL Booloon Busters game cards. I can’t really prove that, it seems plausible. Once your friend or teams chose which pumper you wanted colorful balloons could be secured (I’m guessing) by the metal ring ties. When it was a child’s turn the chosen card would tell him or her how many times to pump their balloon. Without looking at the instructions that are sealed inside the 26 year old game I’m safely assuming if the balloon didn’t burst it was the next child’s turn. This would continue in “rounds” until a balloon bust and a child was declared the victor! What would happen to game time once all 40 balloons were eventually popped? I’m not exactly sure if mom and dad could just buy OFFICIAL Booloon Busters balloons. However, standard party balloons should have sufficed. Probably cost a bit less too. Booloons or no balloons, for less then $5 (even in 21st Century dollars) kids had a deck of cards, a mini proton gun, (nutrona wand) ghost trap, and their imaginations. Who ya gonna call? BOOLOON BUSTERS! Next Post Where’s The Ectocontainment?